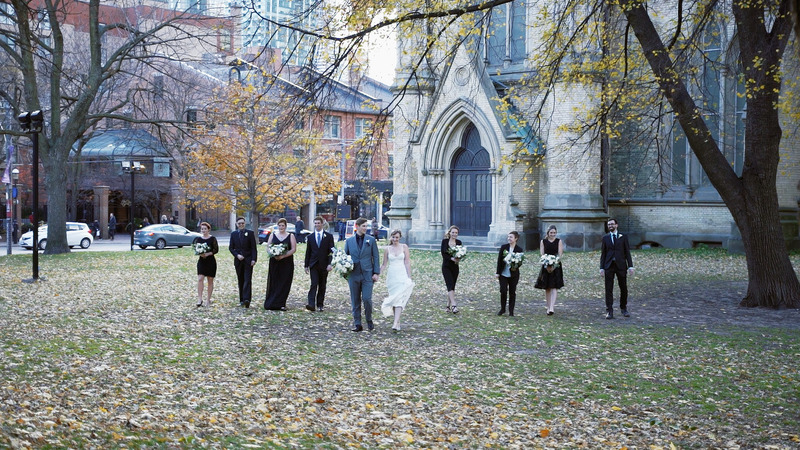 What a start to our Wedding Videography career in Toronto! With a truly unique wedding film set at the stunning One King West Hotel. Its been a long journey, moving our lives, daughter and business from Vancouver. We’re already missing the west coast (we’ll be back soon though)!, but things are shaping up nicely in the Big6. We’re so excited for whats to come. But for now, back to this wedding…. When we began offering Wedding Cinematography in Toronto we couldn’t have hoped to encounter a couple as creative and fun-loving as Patrick and Julia. Being a pretty big geek myself, I loved the incorporation of sci-fi and fantasy into their wedding. I really believe that your wedding is a good reflection of your personality in a lot of ways. You literally make hundreds of choices from how the decor is styled, to the food that is served and the music that is played. As wedding cinematographers we love when couples go “all in”. It means we have so much more to work with in presenting two awesome personalities to the world. I think I must refer to speeches in so many blog posts. But they can often form the backbone to the narrative of so many wedding films. We don’t really hear a lot from the couple in this video, but its totally not necessary. Julia’s maid of honour and mother give us great little nuggets which tell us so much. I love hearing about couples from the people who know them well. Its probably the best way to learn about someone. I mean, its not exactly like you’re going to talk about how great you are right?? These speeches open the door on Patrick and Julias personalties and history. And from an outside perspective, which is something we can share. Its that depth and insight that allows you to learn about them and feel connected. If you’re considering wedding venues in Toronto, One King West is a great space. There’s tons of room, splendid decor (less work for you!) and an awesome bank vault in the basement which is pretty cool for photos. I should take this opportunity to write a little “thank you” to Carlee and Lynzie from Love by Lynzie Events and Design. Not only for referring us to the couple but also for making the day a breeze. Thank you ladies! I’d also like to thank Sonia and Jimmy from Green Autumn Photography for being such great collaborators. This was our first time working with wedding vendors in Toronto and it was a fantastic experience. Can’t wait to do it again! Please check out more of our work here. If you’d like to learn more about our Wedding Videography services, please get in touch!